A tax and financial planning treatise with broad scope, Estate, Tax and Personal Financial Planning (West) is a 5 volume set to help plan and understand the tax implications of estates during life and after death. 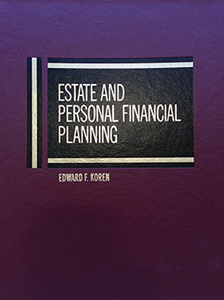 This set by Attorney Edward Koren focuses on wills, trusts, and asset transfers. These areas are further enhanced with detailed information about business, property, family law, investments, and more. The basics: practice essentials, general planning for business owners, ranchers, farmers, and the highly compensated, plus an overview of insurance, retirement plans, and other investments. Estate management and gift giving to family and charitable organizations. Discusses tax considerations when a separation or divorce may occur and estate planning for unmarried individuals. Includes model tax return filing agreements. In-depth analysis of gift giving, plus preparing wills, trusts, and insurance instruments. Covers transfer taxes and testamentary transfers to surviving spouses. A chapter on Planning when death is imminent is a summary toolkit for those with little time to make long-term asset plans that also achieve optimal tax results. Detailed guidance for filing taxes on an estate and dealing with distributions from estates and trusts. Tax forms with sample data, when and where to file, asset valuation, disclaimers, and liquidating an estate are all included here. A final chapter on audits and appeals rounds this out. Estate, Tax and Personal Financial Planning includes detailed tables of Federal and state laws and cases with cross-references to sections from the books. These, paired with indices to the text and forms provide quick access into the set. The fifth volume holds 5 years of tax and estate planning articles and includes its own index.